Visit water heater inspection for more information about this subject. Furnace and water heater vent pipes require clearance to combustible materials – why is that necessary? Gas burning appliances vent pipes produce heat when discharging exhaust gases to exterior. Temperature of the vent pipe is transferred to the surrounding area and all the materials that are in the vent pipe vicinity. Problems start arising if those materials are combustible and located to close to the furnace, water heater vent pipe. If you apply heat to a combustible material for some period of time (that varies between materials), its point of ignition will gradually get lower and eventually little heat will be required to start a fire – that’s why you need a clearance between the vent pipe and a combustible material. Flash point / temperature at which wood will ignite is 572F (300C). 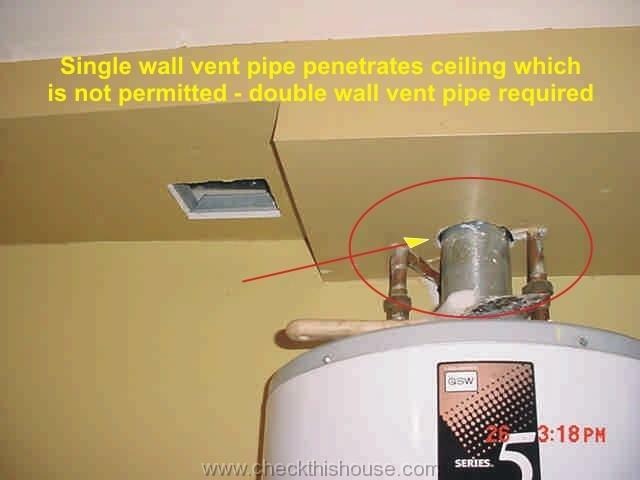 For all of us not aware of this condition, here are the required / minimum furnace, water heater vent pipe clearances and locations where the single or double wall vent pipes can be installed. Single wall vent pipe cannot be concealed inside the wall or floor. Even if you keep the clearances at the entrance and exit from that space, whatever section is inside must be double wall type pipe. A vent pipe is an important part of the gas water heater maintenance – don’t forget your schedule. Reasoning is simple – you can’t see what is happening inside the wall or floor, and if the single wall vent pipe starts corroding, separates, leaks exhaust gases, you’ll have no control over it. 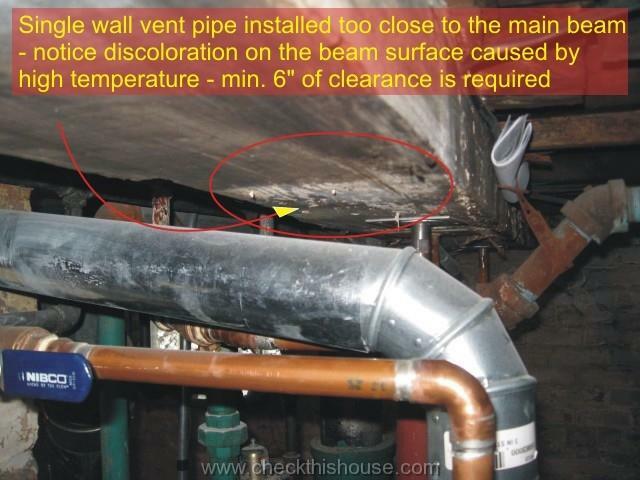 Also, concealed spaces have no way of discharging heat and 6” vent pipe clearance simply wouldn’t help. 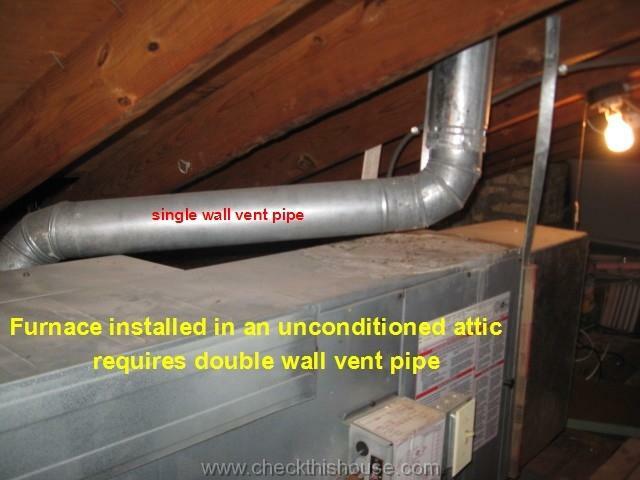 The furnace, water heater single wall vent pipe cannot start in or pass through the attic. Also, it cannot be used in the crawlspace or other unconditioned space. The exceptions are unconditioned basements and garages within the exterior walls if local 99% winter design temperature equals or is larger than 5F. A conditioned space is an area where temperature and humidity are controlled directly or indirectly. An unconditioned space is an area isolated with doors and / or partitions from a conditioned space. Typical examples of an unconditioned space are unheated attics, crawl spaces or garages. Whenever the single wall vent pipe penetrates the roof surface, it requires thimble which must extend 18” above and 6” below the surface. 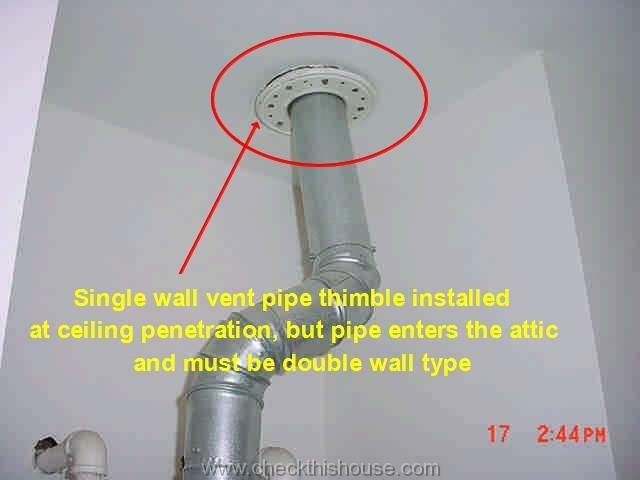 Thimble must be open at the bottom and sealed around the vent pipe above the roof. 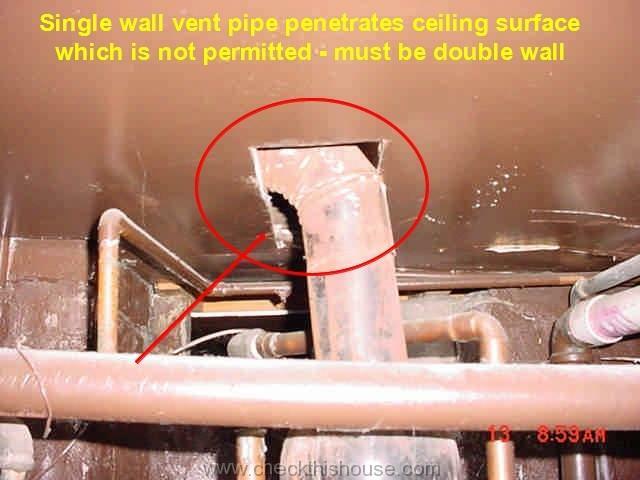 Typical listed and labeled double wall vent pipe clearance to combustible materials is one inch, but you should always check before installation. Maximum horizontal section of the furnace, water heater double wall vent pipe cannot be longer than 100% of the vertical vent pipe length. It will complete the information about the furnace and the water heater vent pipe clearance requirements.